"Our pay rise is now eight months overdue ... and so are our members bills!" 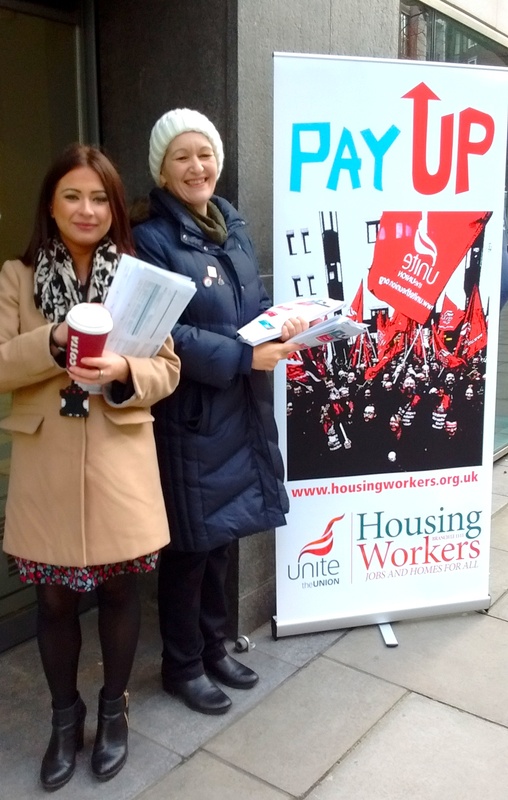 Unite members at the The Homes and Communities Agency (HCA) made their feelings clear during a "Pay Day Protest" on the 15th February. They are angry at the length of time it has taken for their July 2015 pay rise, to reach their pockets. Management at the Agency have refused to negotiate for eight months, saying that they were prevented from doing so until their sponsor department (the Department for Communities and Local Government, CLG) had signed off the proposals. Yet staff at the CLG received their own pay rise before Christmas. 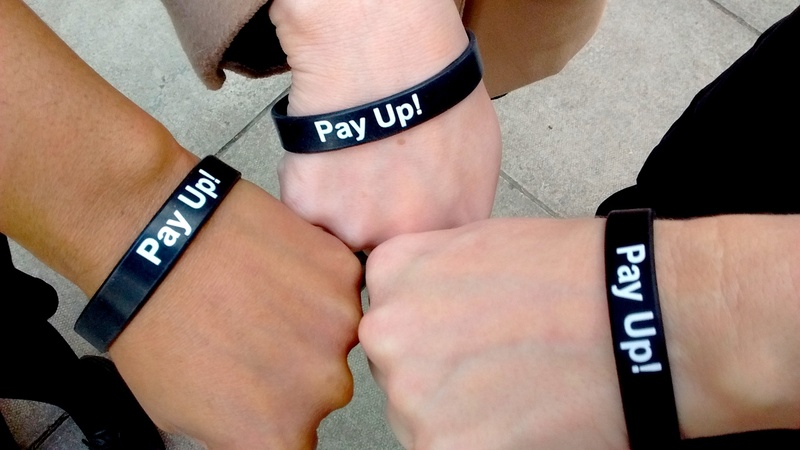 Staff at the Agency's headquarters in Westminster arrived to find information about the pay delay and a black 'Pay Up!' wristband on every desk. The staff were urged to wear these to make their feelings clear, and many supported the call, proudly showing their wristbands to reps throughout the day. The protest generated a lot of interest among non-union members too and much support and interest in joining up. Reps also leafletted outside the office which is shared with other government departments. They highlighted the pay injustice which is leaving many public sector staff to struggle financially. Members have pointed out that they have had to bear soaring housing and travel costs which have made it ever more difficult to make ends meet after years of public sector pay freezes and pay caps. Unite reps highlighted the injustice of public sector pay caps as well as protesting over the delay to the pay settlement. The campaign has already pushed the issue of pay forward. Less than 24 hours after it was launched, a negotiation meeting was set up for Thursday 18th February. 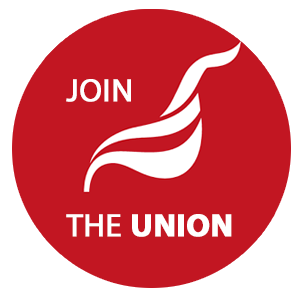 Unite will be demanding a fairer bonus system and withdrawal of the threatened contractual breaches for staff who transferred from the social housing regulator in April 2012, plus a much earlier start to the 2016/17 pay negotiations. The HCA has land, development, regeneration and regulatory responsibilities. It administers the grant to housing associations and the sale of public land, and regulates housing associations across England. If you are an employee and wish to join, please please contact us here or join online here.